This highly anticipated sale kicks off Morphy’s fall sales season and features a world class selection of outstanding music boxes from the 18th century onward. A full spectrum of decorative and functional items from the most collectible makers – including Tiffany, Amphora, Swarovski, Lalique, Faberge, Waterford, Wedgwood, and Majolica – are represented. This event also features exquisite jewelry and collectible coins at a full range of price points. All items from this sale are on display in Morphy’s Denver auction gallery and available for preview now. This event’s outstanding offering of music boxes will strike a chord with collectors everywhere, with 150 antique and contemporary models on offer. An especially noteworthy highlight is lot #100, a monumental carved musical tall case clock, estimated at $60,000-150,000. This one of a kind piece with provenance features a spectacular carving of Robin Hood and is purportedly carved from Sherwood Forest wood. The clock movement contains four trains and its dial is dated 1742. Another highlight sure to be music to enthusiasts’ ears is lot #102, an orchestration interchangeable cylinder music box, estimated at $15,000-30,000. This 55” long music maker in full working order is mounted on a matching table that contains two drawers that flank a center drawer with an integrated desk. The mechanism includes castanets, a drum, a twenty-four note reed organ, and six bells topped with birds. 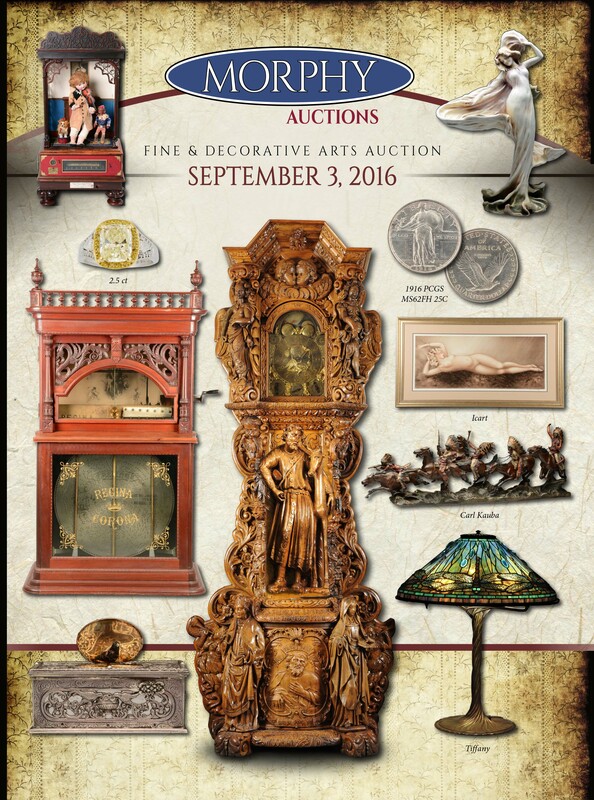 Collectors will also want to tune into lot #103, an oak cased Regina upright changer music box with 12 discs, and lot #50, a 19th century bird in a snuff box within a silver case. They are estimated at $10,000-18,000 and $1,200-2,200 respectively. Enthusiasts will have no trouble feathering their nests with the huge selection of decorative items presented at this sale. There are treasures for every room, floor space, and nook and cranny available. A heavy metal favorite in this category would have to be lot #418, a bronze statue by Carol Kauba of five Native Americans riding horses, estimated at $2,000-4,000. This handsome piece measures approximately 27” long and would make a remarkable focal point for a study, den, or office. Lot #260, a Black Forest Apostles shelf clock, should also generate some fervor. This 30” tall piece with a distinctly old fashioned, religious feeling to it, was made by Gordon Hettich-Furtwangen and is estimated at $1,500-3,000. Lot #581, an extremely rare Amphora ceramic monumental Art Nouveau Iris Vase from the Paris 1900 Expo, features a figural maiden and dragonflies. This example, truly a thing of beauty, is pictured in Vreeland’s Monsters and Maidens Collector’s Edition, and is estimated at $5,000-7,000. And speaking of dragonflies, make sure to turn the spotlight towards lot #385, a 24” tall Tiffany Studios Dragonfly lamp estimated at $90,000-150,000. This gorgeous example takes flight with a fully leaded shade, a Tiffany Tree Trunk table base, and Tiffany tags and stampings. For those who prefer to keep their precious items within arm’s reach, this sale’s amazing selection of fine bracelets, necklaces, and rings will more than satisfy. Fight the blues with lot #491, a stunning natural blue sapphire and diamond ring, estimated at $2,500-5,000. This important ring features a 1.5 carat sapphire surrounded by baguette cut diamonds and comes with an appraisal by Ream Jewelers, dated 1989. And if big bling’s your thing, check out lot #492, a natural yellow cushion modified brilliant cut diamond ring. This gorgeous example, featuring a 2+ carat diamond with two triangular cut diamonds mounted in platinum and yellow gold, is estimated at $20,000-30,000. This remarkable sale is rounded out with fantastic selections of furniture, glass, folk art, silver, and coins, including lot #6, a rare 1916 Quarter, estimated at $14,000-18,000. This coin, in circulation from 1916 through 1930 and designed by sculptor Hermon Atkins MacNeil, features a standing Lady Liberty holding a shield in one hand on one side, and a proud eagle in flight on the other.